The end of January saw the time to begin preparing the gardens for the 2011 season. It was pretty warm here at the time, so conditions were great to get out and clean up all the fall debris. 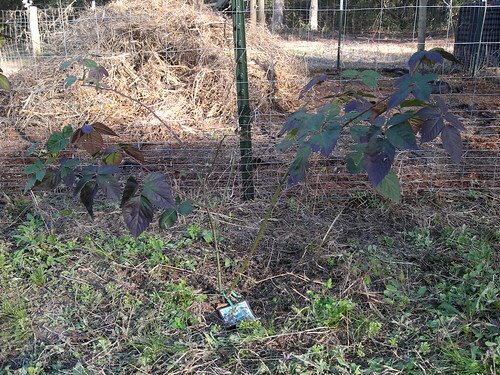 While cleaning up, we found a few plants still going that have been hardy all winter (a few freeze/thaw cycles, even). 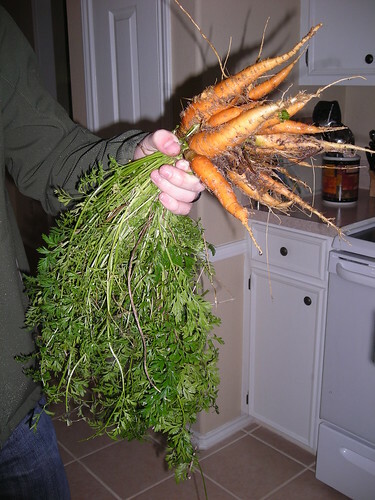 The carrots we planted in spring of 2010 were still going. I had all but forgotten about them because they just weren't any good all summer. Well, apparently they wanted the cool season through fall and winter to really put on some mass. They were nice looking carrots when I pulled them all up. The chives we planted last year were also still going. Not great, but still there. Probably because they had been buried under mountains of unwanted grasses that began to fill the garden at the end of the fall. Our blackberries looked pretty good, too. They started out last spring pretty small. Since they only produce berries on 2nd year or older stems, we ought to get some more berries out of them this year. We only got a few last year, and the birds got 'em before they were ripe. Hopefully they produce enough this year to satisfy the birds and leave some for us. We planted 3 plants last year, but I'm considering adding 2 more to the spot since there's room. The major task of the day, however, was clearing out all of the dead plants left over from our vegetables and the weeds that came in after they died off. We have a pretty big mountain of stuff! It's ready now to add to the brush pile in the back. 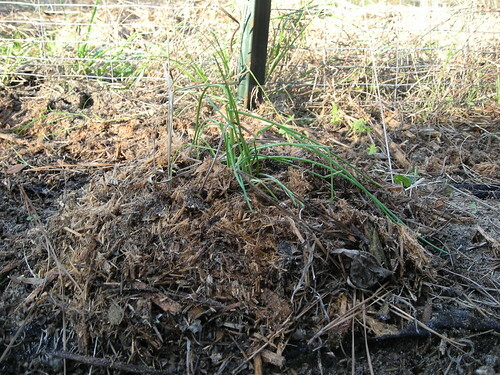 And the brush pile in the back is currently ready for me to bring a chipper in to shred all that stuff up into mulch. This mulch won't go into the vegetable garden. It'll be too full of unwanted seeds. 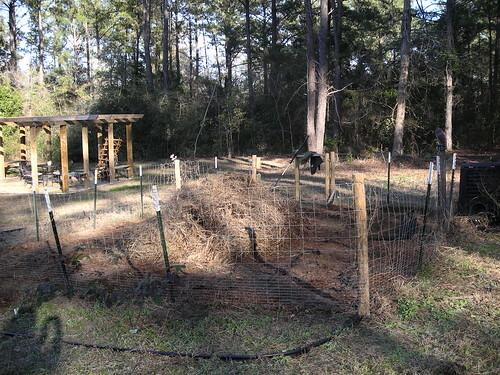 But it'll be good to add a little bit into the compost bin and use the rest to lay out a mulch path through the woods. I would really like to burn that stuff so I can incorporate the ash into the garden, but since we live inside the loop, we aren't allowed to do open burning...and that pile of stuff from the garden will create quite a raging inferno that would burn hot enough to sterilize a LOT of soil (and that would NOT be good for the garden). I will eventually be getting a legal firepit with a cover, and that will allow me to burn some material safely and have some ash and coals to add to the garden. I've selected my list of plants and ordered all my seeds for this spring. I will probably have to do a summer seed order, too, for some fall stuff. Later in the season, depending on how everything else is producing, I may add in some pumpkins and watermelons if I have the space. I got a single 20lb pumpkin last year (early season) and I still have some in the freezer. I hear that some of the blue pumpkins make amazing baking pumpkins, and I may go with one of those varieties later. I may also plant some radishes depending on what my space utilization looks like. If I have a lot of space, I may dedicate a corner of the garden for underground veggies like onions, garlic, and potatoes. We'll see, but if I plant any of that stuff, it probably won't be until fall. Last year, I had the herb garden located within the fence of the vegetable garden. Some things did well there, but others got too cramped and were choked out by the sweet basil. This year, I'm moving the herb garden to an area right off the back of the patio to make more room for both the vegetables and the herbs. I've chosen to plant a few of the same herbs, but a few new varieties.